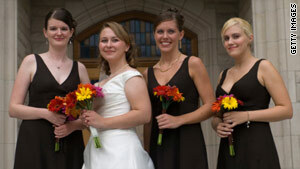 If bridesmaids admit they hate the new husband, the bride may cut them from the picture. Atlanta, Georgia (CNN) -- Imagine this: It's your best friend's wedding day. You are at the altar holding her flowers watching her recite her vows. With tears of joy in her eyes, she says she will love, honor and cherish the groom until death they do part. It is clearly the happiest day in her life and you are crying inside because you cannot stand her soon-to-be husband. Is it possible to remain close to a friend when you cannot stand their spouse? As one of my girlfriends was planning her wedding last summer, she knew that I didn't really like her soon-to-be husband. I made it a point to let her know my feelings about him -- questioning from day one his possessive nature when it came to my friend. She and I continued to be friends. However, during her engagement, the nature of our relationship changed. While I was happy for her because she was happy, I still wasn't completely sold because of my previous doubts about her fiancé. Our friendship seemed to have an invisible veil separating us -- with only our love for each other binding us together. That veil was her fiancé. After a few months, my friend called to tell me she called off her engagement. There seemed to be a sense of relief between us because she realized that my doubts were also her concern. She admitted later that it would have changed our friendship had she gone through with the wedding while knowing I didn't like her spouse. This scenario is one that I believe many friends and family members experience but may not have the courage to confront. A lot of times, friendships simply change or fade away because of that spouse that one of you cannot stand. But more importantly, the inability to be honest about your feelings with your friend is what hinders the friendship. Consider this: What if your friend, so blissfully happy in her own relationship, needs you to be friends with her spouse? In that instance, the friendship is doomed to simply politely passing time with each other. You each start talking in well-coined emotionless phrases such as "wow, that's great" or "as long as you're happy." Is that truly friendship if you cannot be completely honest with a person who you considered a cherished friend? Or is it better to spare the feelings of that cherished friend because you love them too much to hurt them? I have another friend who seemed to cut off a couple of long-term friends mainly because they didn't like her husband. It created such a sad situation, especially since all parties involved truly missed each other. This situation does not have a simple yes or no answer. But I do know that any friendship's success thrives on honest dialogue. You can only remain close to your friend while HATING their spouse if you interact with that friend sans spouse. Even that scenario seems unrealistic, especially once they have kids. Thankfully, I didn't live out the scenario of crying on my best friend's wedding day. And when she does finally decide to get married, I hope I can cry tears of joy knowing that she has met someone who will honor her the way I know she deserves to be treated. Don't you dare call me a cougar!